As I have said previously, if software is eating the world, and I believe it is, we — the businesses and startups focused on creating that software — need good, solid, dependable, knowledge, collaborative developers and more of you. 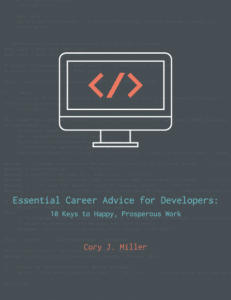 With this book, I want to help developers connect and adapt so that you can thrive in our startups and organizations, so that together, we can build software that changes the world. Get involved and contribute to an open source project. Remember, always & forever: It’s all about people. Good communication skills are almost as valuable and important as programming. Park your arrogance at the door. Get out from behind a computer screen and meet people. Make sure you power down regularly. Always, always, always be learning and exploring.